Totaline P110-1045 (#10; AP10) Water Panels made by Carrier. The Carrier-Totaline P110-1045 water panel is equivalent to the Aprilaire #10 (AP10) water panel. 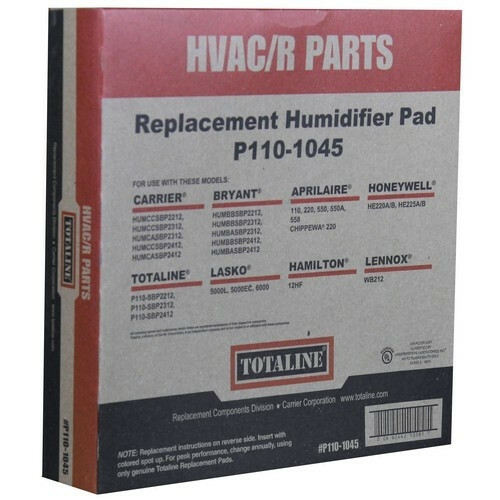 The Carrier-Totaline P110-1045 (#10) Water Panel is for use in the humidifier models listed below. Your humidifier water panel should be replaced regularly to maintain adequate humidifier performance. More frequent changes will be needed if the humidifier is used extensively or if hard water is passing through the unit. Check the panel on a regular basis and replace it when crusty deposits appear on the panel or other parts.